On dead eucalypt trees and logs, often favouring fire-damaged wood. Curry Punk is named for its persistent curry smell which develops with age. 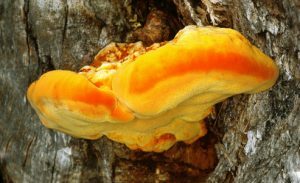 The white top of this large, thick bracket becomes stained pale cream to orange by the orange flesh. 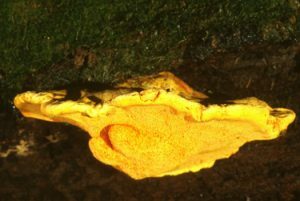 Deep orange-yellow pores exude copies amounts of saffron-yellow juice.